This product requires the base game Tower!3D Pro. Welcome to the busiest airport in the world. Opening in 1926 as Candler Field on the 287 acre (116 hectare) grounds of an abandoned racetrack. 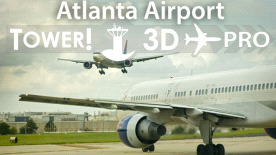 In 1942 Atlanta was first named the busiest airport in the United States. In 1961 Atlanta opened the largest single terminal in the United Sates and saw 9.5 millions passengers (3.5 million more than the designed capacity of the terminal). 1971 saw the airport's name again changed, again twice, to William B. Hartsfield Atlanta Airport in February and to William B. Hartsfield Atlanta International Airport in July. KATL opened the world's largest terminal complex in 1980. Requires the base game in order to activate this DLC.